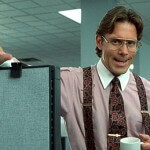 Of course, a well run office doesn’t make employees look for any excuse to go home! Obex panel extenders can turn each workspace into a customized area for the designated employee, making them feel at home and comfortable. 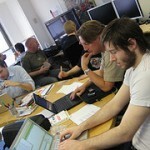 Think about ways you can make your office more appealing for your workers! Oh, and share your funniest office joke in the comments. Is Death by Cubicle Really a Thing? About 40 million working North Americans work in cubicles. Some like it, some don’t – and the correlation between those who feel positive about their workplace and those who don’t is directly related to how their workplace is managed, more than it is the mere fact of being a cubicle worker. 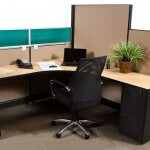 The modern-day cubicle has been formally denounced by the man who actually came up with the idea – Robert Propst. Cubicles were put forth by Propst in 1968 as a way to increase office productivity by providing personal work-spaces with plenty of shelving and increased work-surface areas. He hoped that this would help out office drones who were having difficulty with more open work-spaces that gave little storage or utility space and were so open distractions were common. With cubicles, he felt, employees would have more room to work; partitions could be used to pin up projects and to provide the privacy that the earlier open offices lacked. Surprise – the original plan also called for adjustable desk levels, similar to today’s “newfangled fad”, with the idea that workers could benefit from the chance to spend some time standing up. 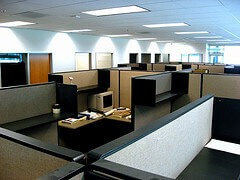 Overall, cubicles were supposed to be beneficial to the worker. After all, health can be largely dependent on your environmental comfort, which is determined by whether your immediate space meets basic physical, functional and psychological needs. A well appointed cubicle with panel extenders of appropriate height would give each employee space and privacy to work, without completely cutting them off form their fellows. Sadly, economics completely screwed up Propst’s dream. Office space costs climbed, and instead of being focused on worker benefits, cubicles were used to maximize real estate. They became tiny and cramped, and designed to cram a lot of people into a limited area. Instead of being the flexible units that Propst intended them to be, cubicles became rows of cages, and the term “death by cubicle” emerged. TV shows, comic strips and movies made sharp commentary about cubicle life, pointing out that people were being trapped in boxes while being encouraged to think outside them. Productivity fell, as did worker health, satisfaction, and stability. But death by cubicle doesn’t have to be a thing. 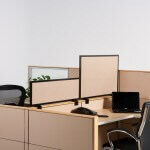 Cubicle panel extenders and a larger footprint can make cubicles worker friendly again! Are Higher Cubicle Panels Killing Workplace Socialization? Advocates of open office plans say high cubicle walls restrict workplace socialization. As a result, many office managers don’t like to see walls that come up higher than a seated employees eyebrows, on the premise that workers who can’t see and hear the person near them feel isolated and alienated. However, that’s not the case at all for many workers, who find that they simply can’t concentrate without a place of their own. Could it be that higher cubicle panels actually improve connection and communication in the workplace, rather than preventing friendly and amiable interaction at work? When surveying groups of office workers, it turns out that the pet peeve of many is constant interruptions when they are trying to finish a task before deadline or day’s end – or worse. Interruptions is actually often used as a polite term for unwanted socialization, with the workers who want to do the job and go home resenting those who treat the office like a ninth grade school hallway. Cubicle height extenders can help alleviate some of the aggravation, by making it just a little harder to invade someone else’s space. When a co-worker has to literally walk into the other person’s private workspace in order to speak to them, generally having to get their attention from behind their back, the amount of unnecessary interruptions goes way down. In contrast, when someone can simply stand up and holler at a coworker on either side or across from them, the temptation to gossip, chat and socialize when not appropriate is encouraged. Even the simple act of rolling a chair around the corner to talk to another cube worker has the potential to make employees more mindful. It’s kind of like having candy stored on the top shelf in the pantry instead of in a candy dish at your desk. You appreciate it more (and are less likely to overindulge) when the candy is not staring you right in the face all day. With low cubicles installed as the standard and panel extenders used to customize work-spaces, all employees can have the level of privacy and comfort they need to be happy and productive. Is your office a cacophony of racket, making it nearly impossible to get work done? Here are some ideas to help. First, a cubicle extender could mean the world if your boss can be convinced it’s in his or her best interest to make the investment. You might do an informal poll among your office employees to see if they feel productivity would go up if they had a more private place to work in. Cubicle privacy panels can be adjusted at different heights for each employee’s needs, and really enhance working conditions for those who work alone, while other desks can have shorter cubicle walls to allow collaboration between team members who need a more back and forth working environment. While corporate is taking the idea of adding cubicle panel extenders to the budget, here are a few things you can do to limit distraction. Wear earplugs. They can help down out repetitive annoying sounds, like the guy four rows over who keep clearing his throat, the printer coming on and shutting off, or the fax beeping incessantly. Wear headphones. These are a boon if other people continually want to chat when you are trying to work. It’;s a social barrier as you are obviously listening to something and they would have to shout to get your attention. Play soothing sounds. Even if your boss doesn’t allow a radio in your cubicle, you might be able to slip a sound machine in that produces a calming overlay on top of the office jangle. You can even find websites that can play soothing sounds like rainfall on low on your speakers. Be firm about interruptions. Let co-workers know you have a heavy workload and you can’t get everything done if you take time out to gossip. Ask for a desk in a quiet part of the office. Can’t hurt! Don’t give up if you have trouble staying focused. Keep trying things until something works, and rally other employees to your cause. Your boss might be tempted to try something new if you show them stats on how better working conditions do increase quality performance and productivity!